Bathurst Street becomes a local food Mecca (photo: Chris Crerar). On Sunday locals flock to Farm Gate Market, a market that’s off the map for most tourists. Megan Blandford plays Tassie native for a day. 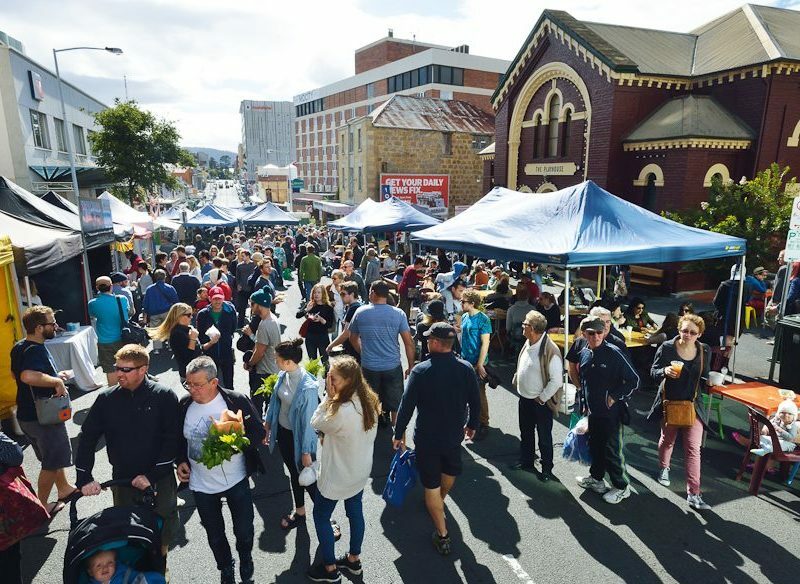 Apparently there’s some big market in Hobart on Saturdays (the famous Salamanca market), but the locals leave the visitors to it and save their shopping lists for Sunday; it’s as though they know something we don’t. They are, indeed, holding a special secret. When Sunday rolls around, the Farm Gate Market closes off a block to create an inner-city food haven. 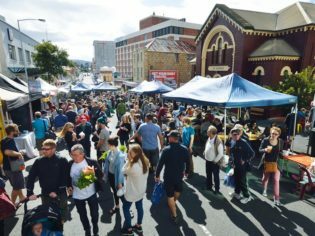 It’s Hobart’s other great market, a low-key affair that’s gathered a loyal following of locals and visitors in its six years of life. But this isn’t just any farmers’ market: this is one with a Tasmanian twist. Octopus tentacles sizzle on the barbecue, laksas are made to order, while wood-fired garlic pizzas and wallaby burritos all compete for your nose’s attention. People wander with baskets brimming with fruit, veggies and flowers, sipping their choice of coffee or bone broth past a farmer shucking oysters at his small stall. Bruny Island oysters to go, Hobart Farm Gate Market. Further along there’s a queue of a couple of dozen people, moving slowly, at an unassuming-looking van. They could join a faster-moving line at another stall, but no one is jumping ship; they’re dedicated to the wait, led perhaps by the subtle, inviting aroma of freshly grated Tasmanian wasabi. At this small stall, Japanese sushi master Masaaki is obviously in no rush. Seasonal colours, Farm Gate Market, Hobart (photo: Chris Crerar). He chats to customers, making their sushi like a carefully constructed piece of art, knowing that those waiting understand that the pre-made stuff they’re used to is a very different taste to his offerings using local seafood and vegetables from his garden. Eating in the city streets, the crisp breeze flying in from the harbour, tapping your feet to the busker of the day: Sunday mornings don’t get much better than this (except when you finish off with a sourdough doughnut). Hobart locals are smart: they want a weekly food experience to remember. And it seems the Farm Gate Market is where tastebud memories are made. Tasmanian garlic straight from the farm (photo: Nick Osborne). When and where? The Farm Gate Market is on Bathurst Street, between Murray and Elizabeth streets, every Sunday 8:30am – 1pm.